The site has a trapezoidal shape 110 meters deep between the ocean and the road and 42 meters along the beach. 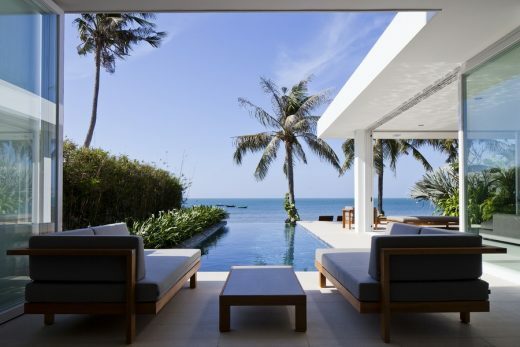 The sea front view is amazing and unusual for a private residential project in this area, usually occupied exclusively by resorts and hotels. 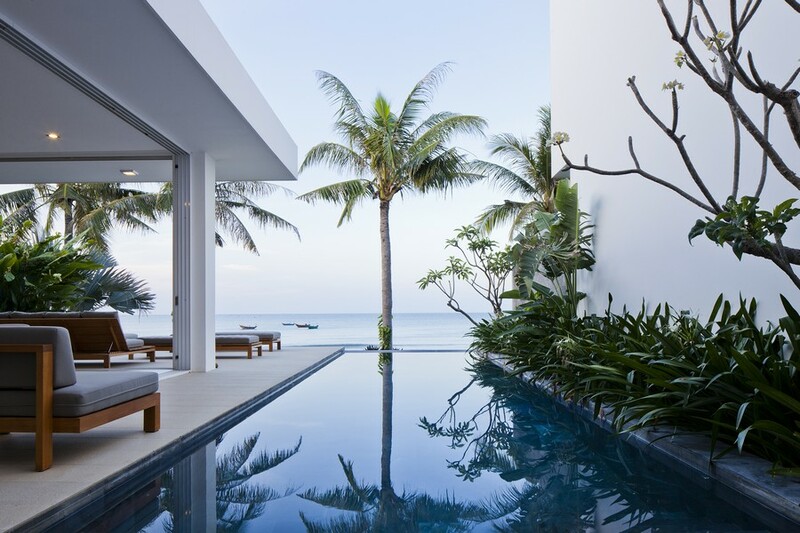 The idea was to maximize this potential with semi-detached sea front villas and keep a large part of the land as a “buffer” landscaped area to prevent noise from the road. 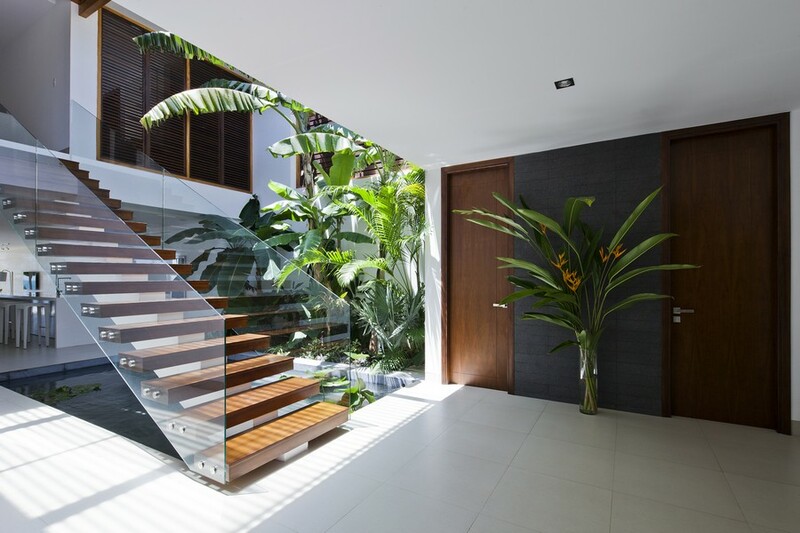 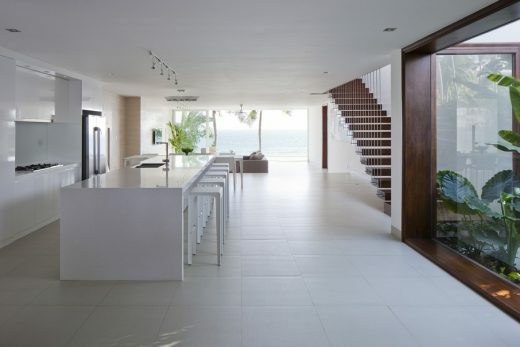 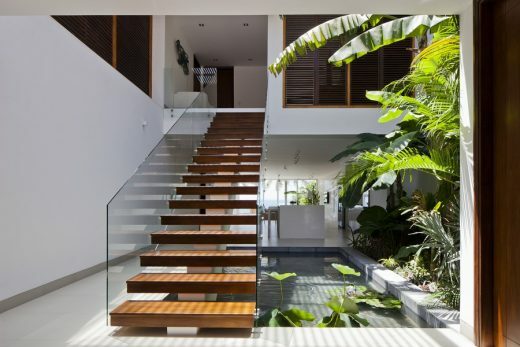 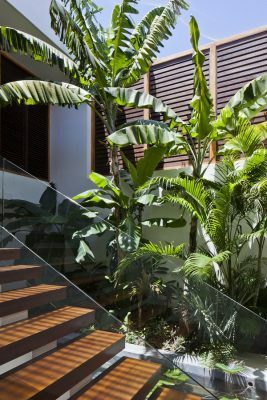 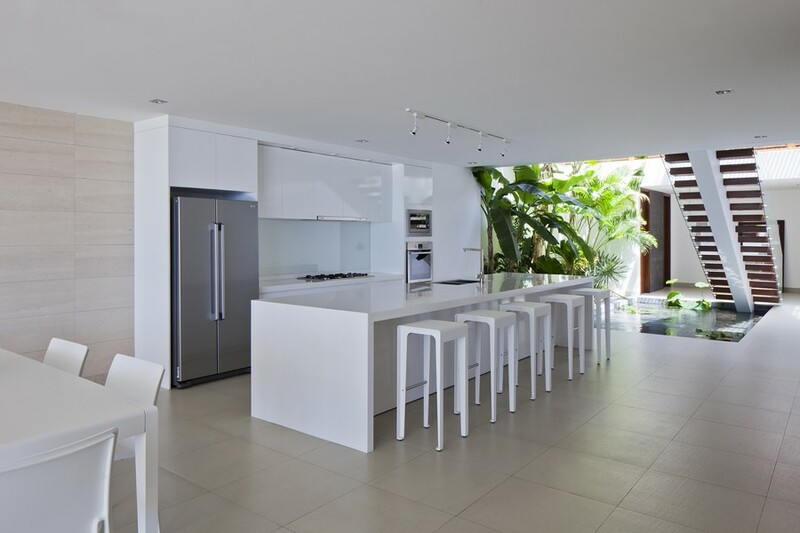 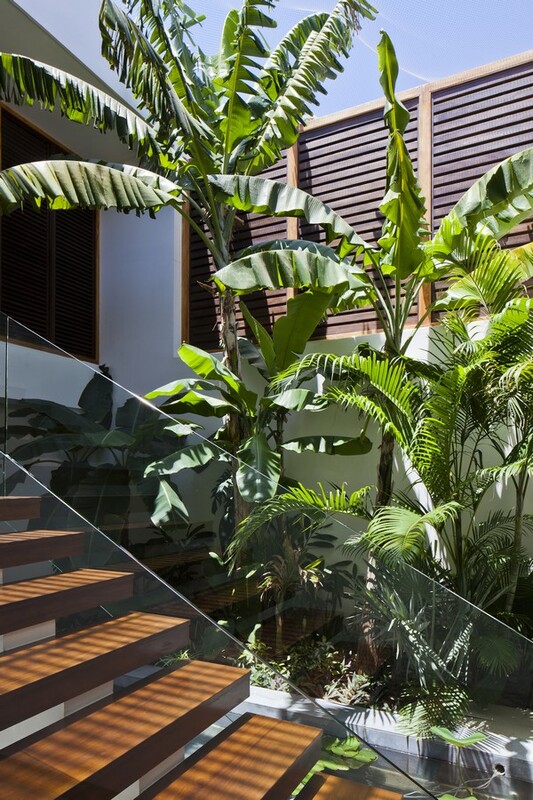 – On the ground floor the kitchen, dining and living room are merged in one single space mono-oriented to the beach front while the back has been designed with a patio open to the sky to bring sunlight, natural ventilation and a nice sequence for entrance and staircase with the pond and the interior tropical garden. 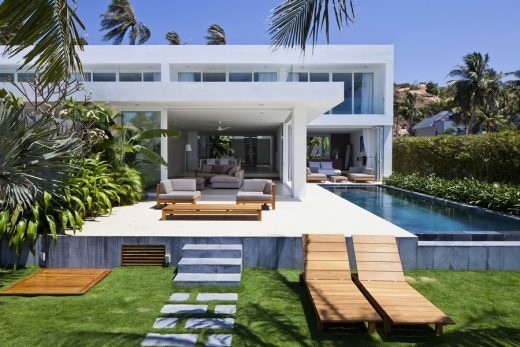 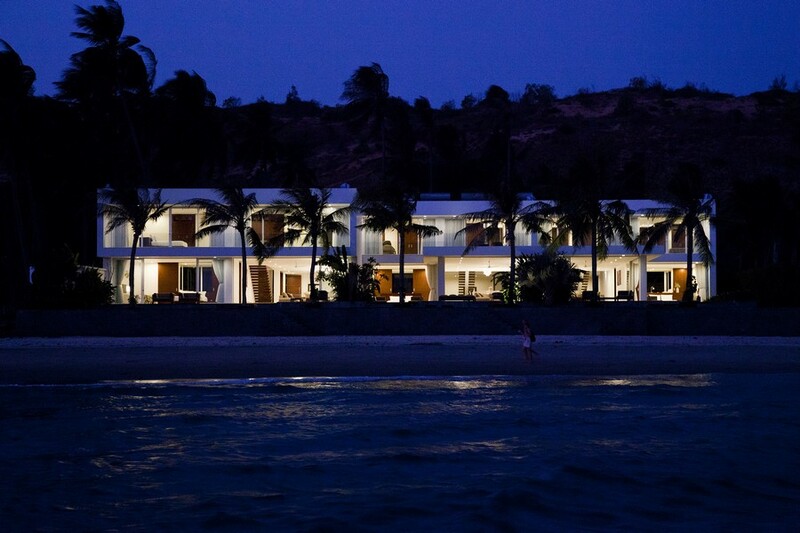 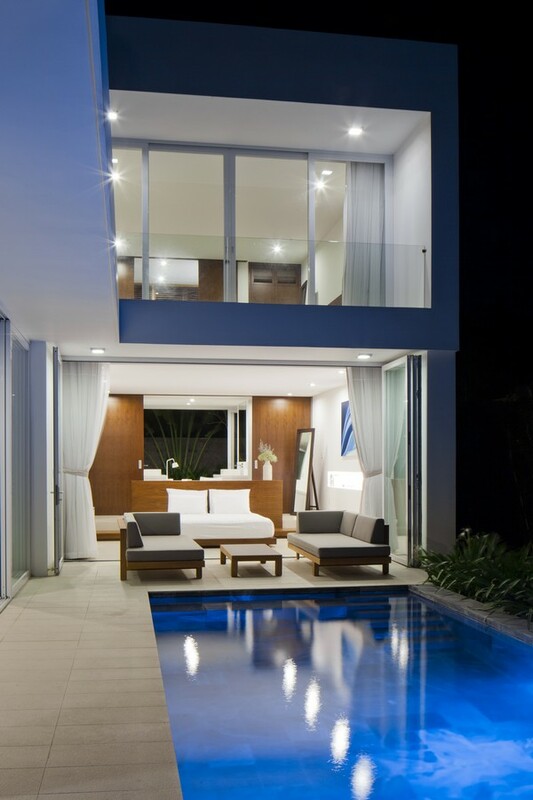 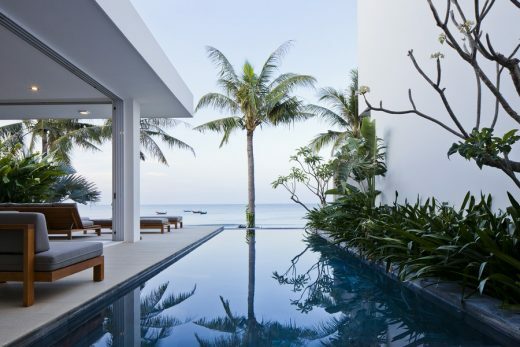 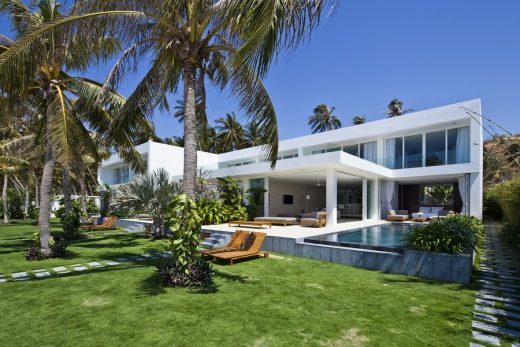 – Master bedrooms are open to the infinity swimming pool and by extension to the sea. 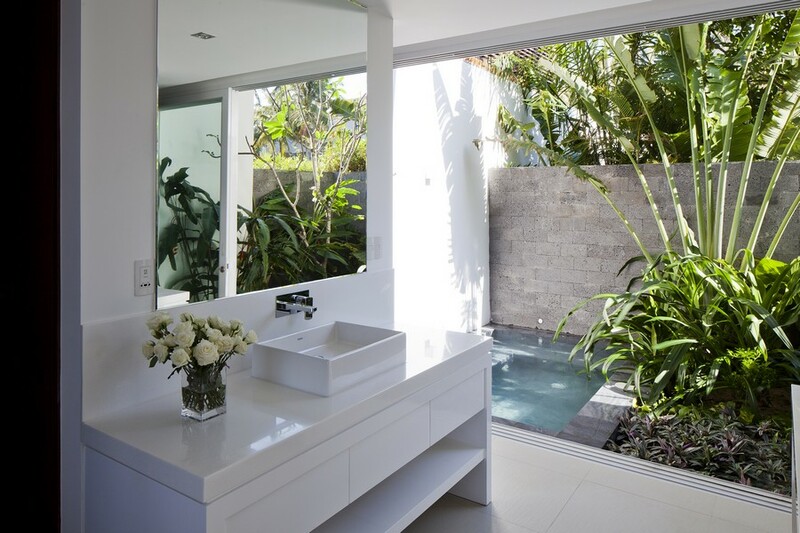 In the back, each bathroom has a private garden with Jacuzzi, bringing light, ventilation and strong outdoor/indoor connection. 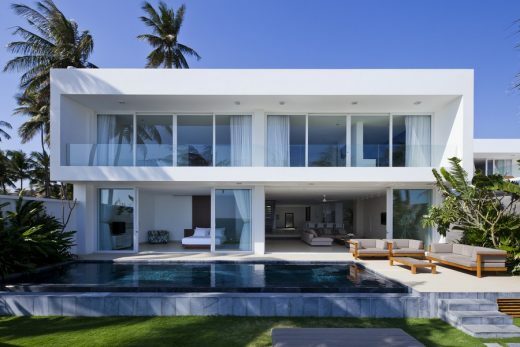 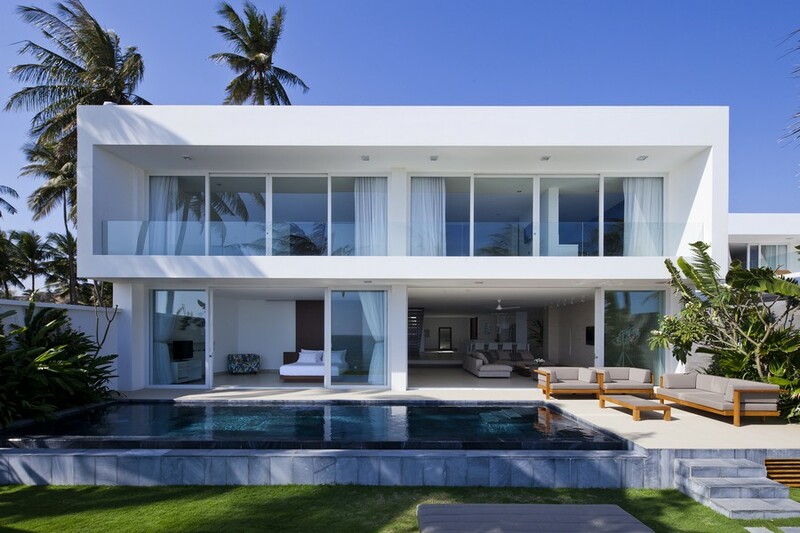 – On the first floor, all bedrooms have a large ocean view with floor to ceiling windows recessed in the concrete structure providing enough shadows. 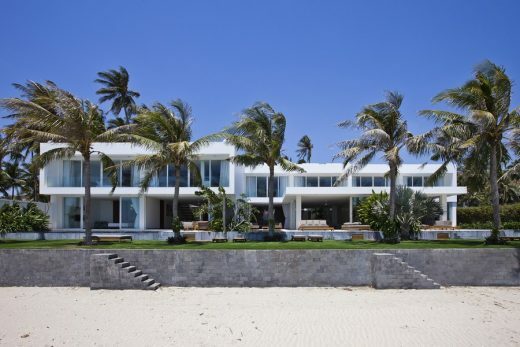 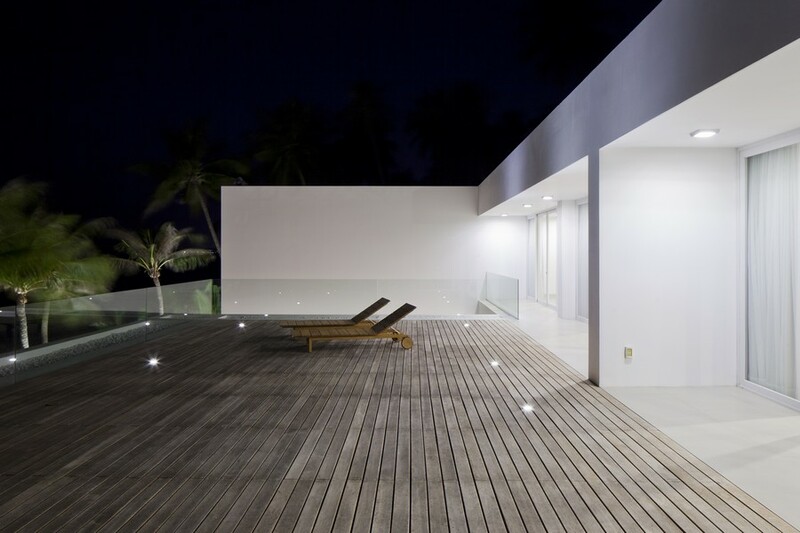 On the front, the flat roof becomes a huge timber decking terrace, extending possibilities to contemplate the ocean. – In the back, are located the bathrooms, naturally ventilated through timber louvers. 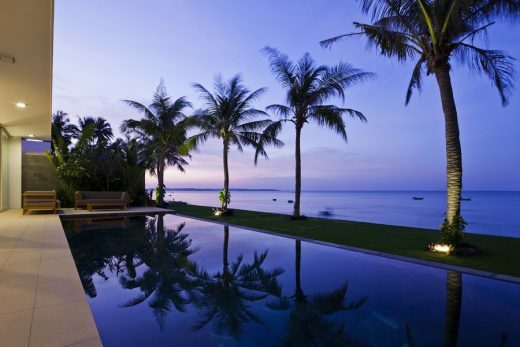 This amazing location, so closed to the sea, is a dreaming place for living. 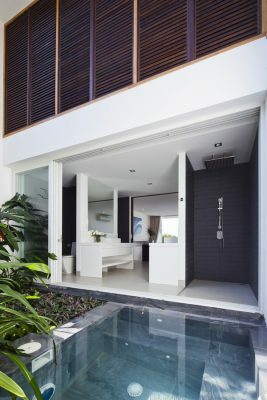 This project tries to not miss this opportunity to offer to the guests a total and unique “seaside” experience. In line with our practice, the materials are basic and the design is minimalist, focusing on the quality of each space with no sophistication.